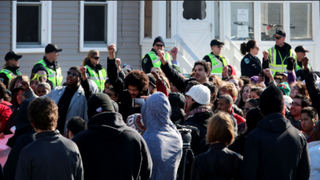 Protesters gather during a rally after an unarmed teen, Tony Robinson, was shot and killed by police in Wisconsin. Friends of the unarmed, black Wisconsin teen who was gunned down by a Madison police officer were questioned for hours without legal counsel or family present after the fatal shooting, BuzzFeed reports. The news site was given a video that shows attorneys and family members arguing with officers trying to gain access to two brothers, Anthony and Javier Limon. The Limon brothers live in the house where Tony Robinson was shot, although neither was home at the time of the shooting, BuzzFeed reports. According to the report, after the shooting, the young men were taken to a Madison police station and questioned for hours. Craig Spaulding, who was present at the time the brothers were taken into custody and considers himself their “surrogate dad,” claimed that Anthony Limon told him that he wanted a lawyer brought to the station. Anthony Limon also reportedly called Everett Mitchell, an attorney, who told BuzzFeed that he got a call from the young man while he was in the station, saying that he wanted a lawyer. In the first video, Mitchell can be seen arguing with the officers, insisting that the brothers requested his presence. “They called me up; that’s how I got down here,” he could be heard saying.